Protein bars are nutrient dense snacks that are often high in protein. They make for great junk food alternatives and a decent way of getting in vital nutrients when food is other wise scare. There is a seemingly endless amount of different protein bars to choose from on the market. If you’re lifting weights, try a high-protein bar to help fuel muscle growth and repair. If you love jogging, hiking, walking, or biking, try a high-carb, organic, energy type bar. If you’re looking for a protein bar that does not use a high amount of preservatives, a raw food protein bar might be for you since they are packed with nuts, berries, and organic herbs. Several forms of protein were utilized in these 10 nutritional bars products, lead by whey protein, brown rice protein, and pea protein isolate. From a weight standpoint, protein bars had only minor deviations in protein content. Sports nutritional bars like Musclepharm and Met-rx have alleged larger protein content due to being 2-3x bigger than your average protein bar. Currently, a majority of protein bars on the market are “emulsified” meaning the ingredients are gathered and then blended together to form a paste. This makes production cheaper for the supplier and often less healthier for the user. KIND bars are currently one of the few brands to use whole, raw ingredients. Emulsified protein bars are often filled with artificial sweeteners, flavorings, and preservatives. LÄRABAR is one of the few brands to offer a higher quality emulsified protein bars. Fat and sugar content generally corresponded closely to label claims, except for protein bars that use sugar alcohol to mask sugar content. There is good scientific evidence suggesting that protein is effective at supporting muscle mass gains and overall weight management. Research shows that protein bars aid fat loss during hypo-caloric diets (eating below caloric maintenance to sustain body weight) due to being higher in nutritional value then typical go-to junk foods like candy or potato chips. Increasing protein in your diet in general increases lean body mass. Onlinestrength scored Kind Strong Bars as #1 – ranked in overall quality. 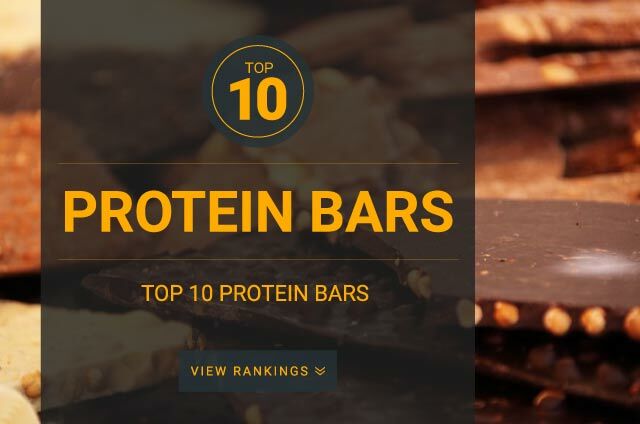 MusclePharm Combat Crunch Bars ranked #10 in this category. Generally, protein bars that contain a low amount of sugar tend to be healthier than those with higher sugar content. Be aware that added artificial sweeteners like sucralose and maltodextrin are used to improve flavor but they may be potentially harmful to some individuals. Purchasing protein bars that have more sugar from natural sources (honey, fruit, etc) is better than eating protein bars with low sugar content but with a high amount of artificial sweeteners. Stay away from protein bars that use a ton of artificial ingredients and sweeteners. Avoid protein bars that have a ton of ingredients. Bars that contain a ton of extra ingredients are often very unhealthy for you to consume on a daily basis. MET-Rx Big 100 Colossal bar exceeds 30+ ingredients where as LÄRABAR bars only contain 3-5 whole-food ingredients. There really is not an exact science to eating proteins bars or even when you should eat your protein bars. If you’re on a low carb diet, eat a low carb protein bar when hungry is on the rise or as a healthy snack instead of junk food. Fitness athletes or individuals eating protein bars as a source of nutrition and protein can eat a protein bar before, during, an after exercise to fuel recovery.